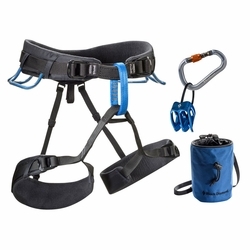 Black Diamond Momentum DS Harness Package. A versatile climbing package featuring Black Diamond's comfortable, highly adjustable Momentum DS harness and all the essentials you need to get out on the rock. The ideal collection of climbing gear essentials, the Black Diamond Momentum DS Package provides the essentials to get you out on the rock, no questions asked. Our Momentum DS harness features a tall, super-comfortable waistbelt and four Speed Adjust buckles for fast adjustability and huge fit range, while the ATC-XP and RockLock Screwgate carabiner provide reliability and security while belaying and rappelling. A Mojo chalk bag and some White Gold round out your kit.